American technology satellite. The Three-Corner Sat mission was to obtain stereo images of clouds and test artificial intelligence software. Technology satellite built by Arizona State University (ASU) (#Sparky), University of Colorado at Boulder (CU) (#Ralphie), New Mexico State University (NMSU) (#Petey) for Arizona State University (ASU), University of Colorado at Boulder (CU), New Mexico State University (NMSU), USA. Launched 2004.Launched 2004. AKA: Nanosat;Three-Corner Sat. Status: Operational 2004. First Launch: 2004-12-21. Last Launch: 2004-12-21. Number: 2 . Gross mass: 16 kg (35 lb). Height: 0.40 m (1.31 ft). Diameter: 0.30 m (0.98 ft). The satellites, nicknamed "Ralphie" and "Sparky" by organizers, each carried four digital cameras pointing in different directions. Artificial intelligence software developed by NASA's Jet Propulsion Laboratory in Pasadena, Calif. and software from Interface Control Systems in Boulder, was to allow each satellite to make onboard decisions during the mission. The smart software, for example, could detect unexpected events and change the scheduling of satellite operations. Three-Corner Sat was a joint effort of CU-Boulder, Arizona State University, New Mexico State University, NASA and the Air Force Office of Scientific Research. The project was undertaken by students, primarily undergraduates, at the schools as part of the NASA-sponsored Space Grant Consortium program that began in 1989. The mission had been altered and delayed from its original plan. 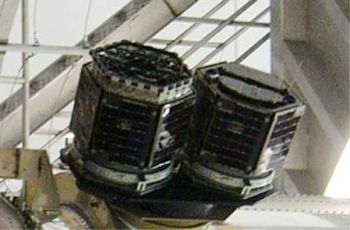 Three satellites were built as part of the mission and were originally slated for launch aboard the space shuttle in 2003. After the shuttle Columbia tragedy in 2003, mission organizers pursued other means of launching the satellites and early in 2004 were offered an opportunity to be a part of the first launch of the new Boeing Delta IV Heavy rocket. Because of weight and space limitations, only two of the three satellites were to be launched. Family: Technology, Technology satellite. Country: USA. Launch Vehicles: Delta IV, Delta 4H. Launch Sites: Cape Canaveral, Cape Canaveral LC37B. Agency: USAF.